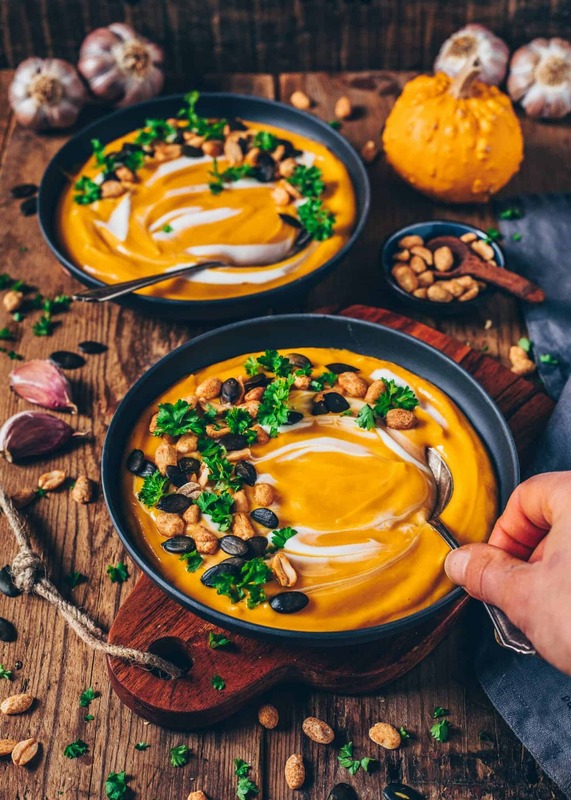 This vegan roasted pumpkin soup is super creamy, delicious and healthy! It’s very easy to make, full of pumpkin flavors and the best way to warm up! Winter coming closer and temperatures dropping, means I’m always looking for comfort food that keeps me nice and warm in these colder months. 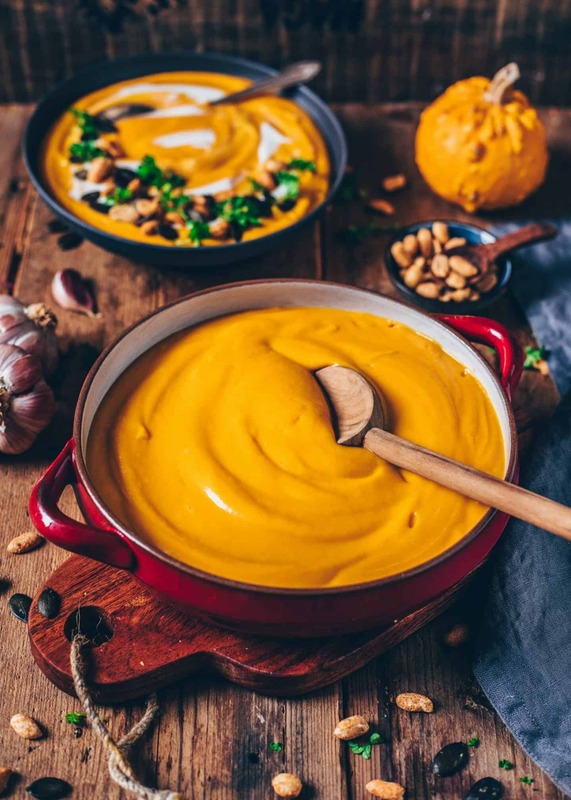 And what could be better than enjoying a big bowl of delicious creamy pumpkin soup while cuddling up with a blanket when it’s cold outside? I don’t think there’s anything better than that! 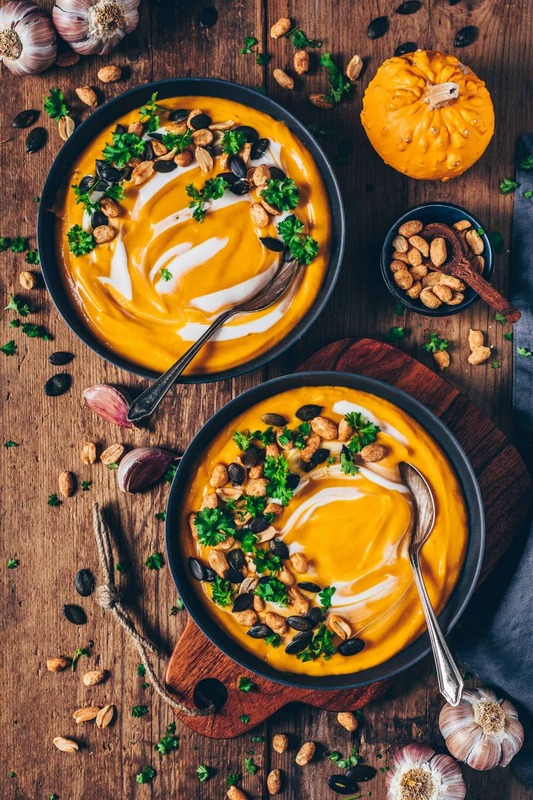 Meet my absolute favorite pumpkin soup recipe! 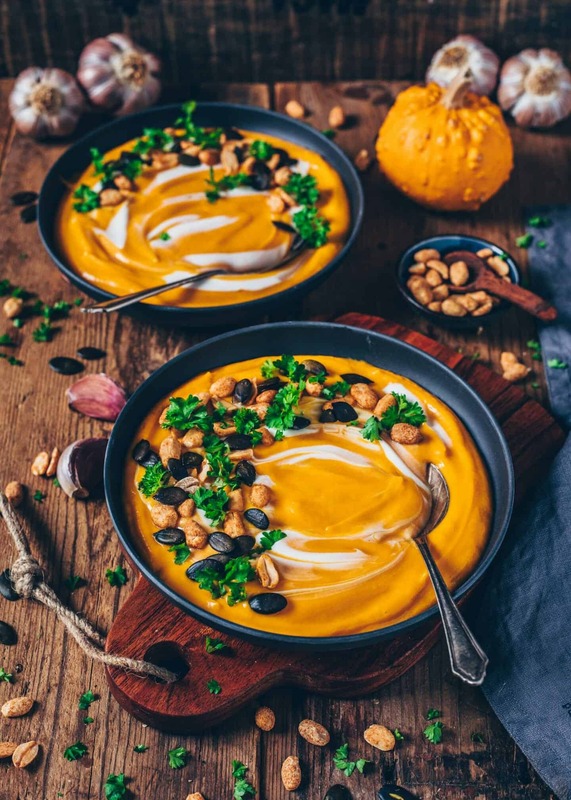 This vegan roasted pumpkin soup is not only super delicious but also healthy and satisfying! It’s one of my all time favorite fall and winter recipes, and also my family loves it so much too. 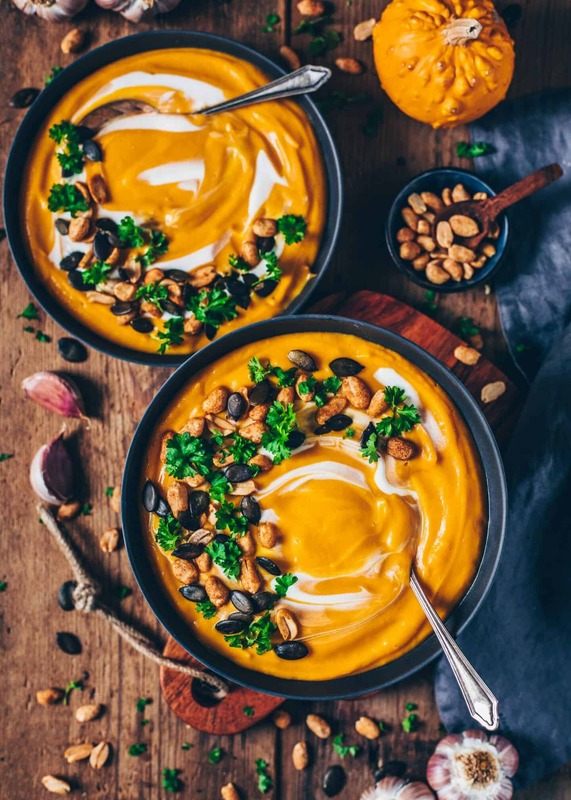 I’ve already shared my favorite pumpkin soup recipe last year, however, I’ve made it so often since then and I changed a couple of things. 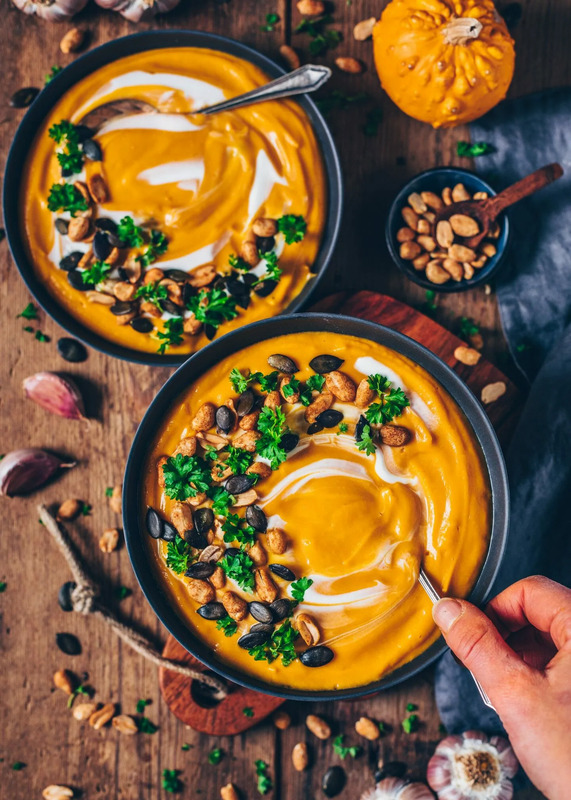 Since I make this soup with roasted pumpkin instead of cooked pumpkin, this soup has a more intense flavor and is extra special, so it was time for a recipe update. 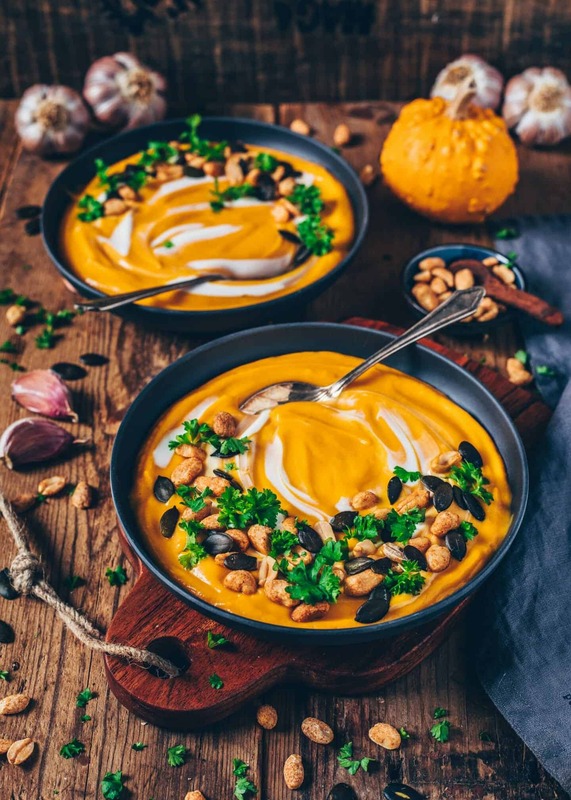 To make this roasted pumpkin soup you need only a few simple ingredients. 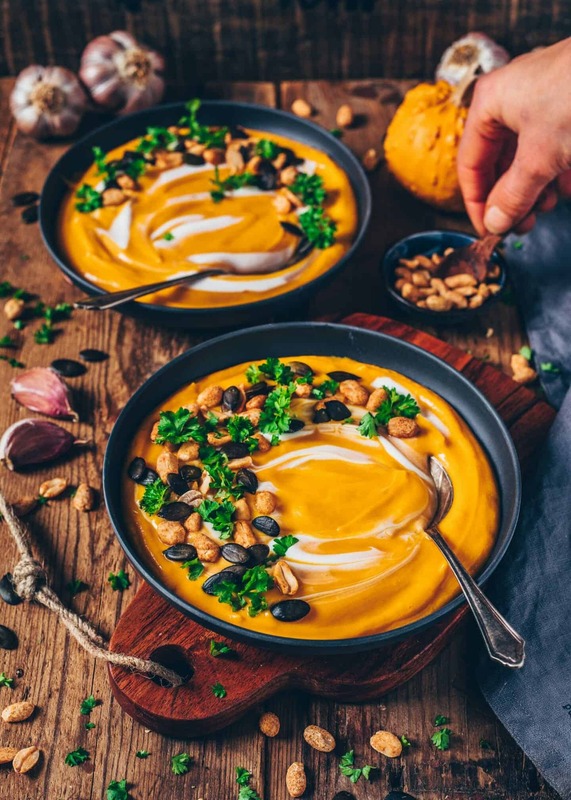 It is basically made of roasted pumpkin and coconut milk, which makes this cozy soup super creamy. I also added a few aromatic spices for some warming and inviting extra flavors. 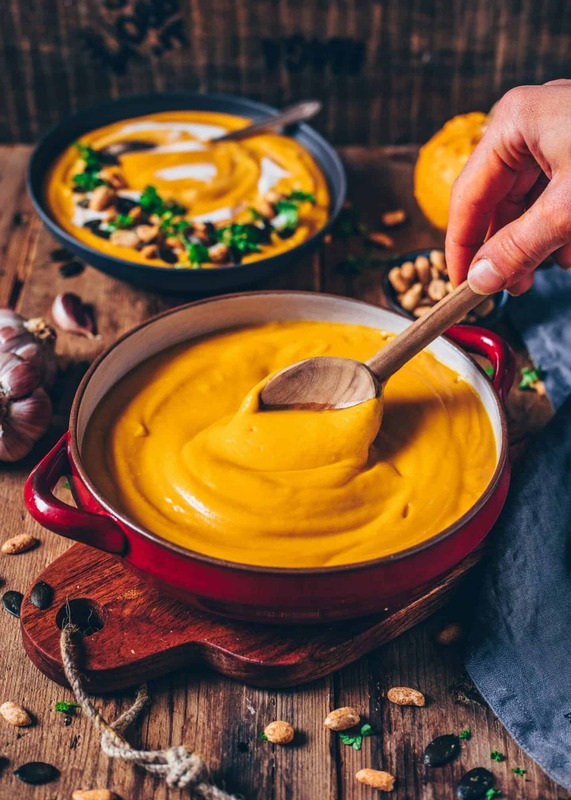 Anyways, if you made the pumpkin purée in advance, this soup comes together in a few minutes! So it’s a perfect meal, if you want a quick warming lunch, dinner or just an appetizer. 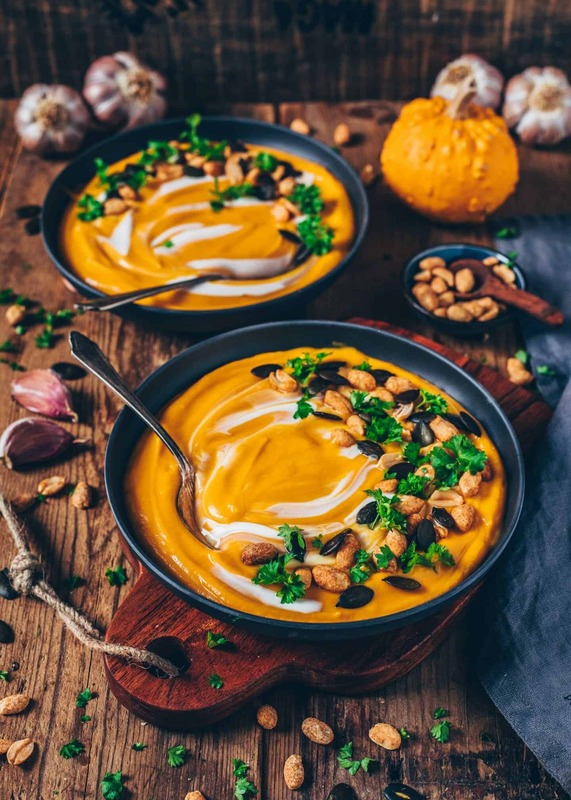 I love including pumpkin into most of my fall recipes. Especially roasted pumpkin, it is my favorite way to prepare it, because it brings out the full pumpkin flavor. Mostly, I use Hokkaido pumpkin (Red Kuri Squash) because it’s perfect for roasting and turning into homemade pumpkin purée. Of course, you can use any type of pumpkin or squash you like. 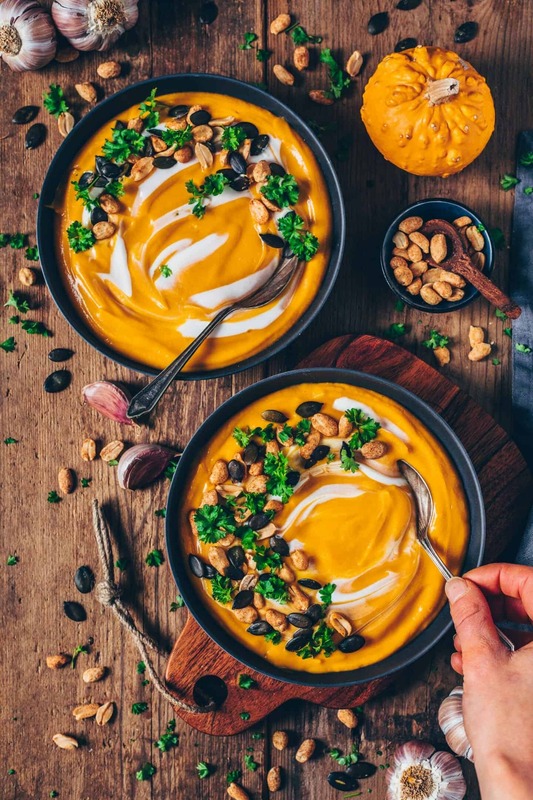 I’ve already made this soup with butternut squash and it was just as delicious! Anyways, roasting the pumpkin is the only part of this recipe that takes any length of time. But once it’s done, this soup comes together super fast! However, if you’re in a time crunch, you can simply use canned pumpkin purée. 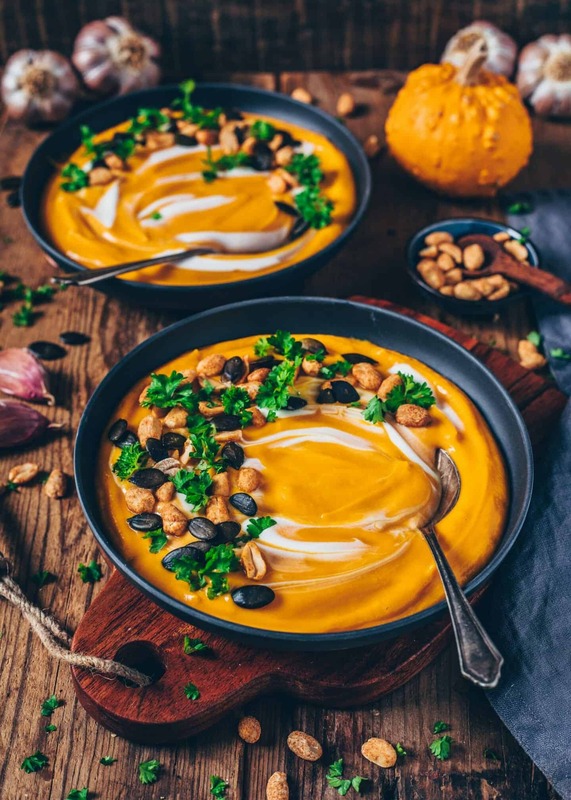 What I also love about this creamy vegan pumpkin soup recipe is that it’s not only so easy to make, but it’s also ideal to make ahead. To me, the leftovers taste even better the next day, so you can make the soup a day in advance. 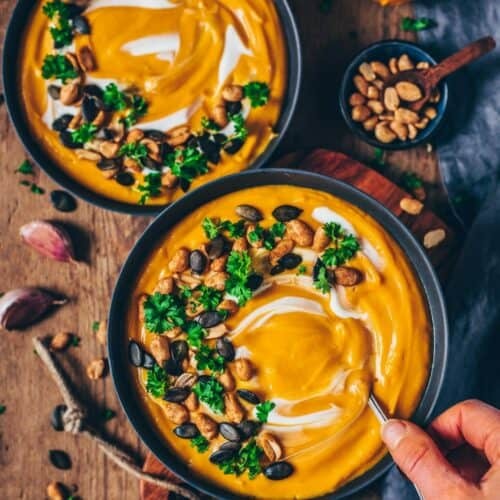 You could also double or triple this recipe and freeze it in batches for later, then you can always have a delicious homemade creamy pumpkin soup when you’re in the need. I think meal prep just got a whole lot easier, right? Preheat oven to 425°F (200°C). Halve the pumpkin and scoop out the seeds. Slice each pumpkin halve in quarters. Prick the sweet potato a few times with a fork (if using). Brush pumpkin quarters and sweet potato with a little olive oil and place onto a baking sheet lined with parchment paper. Roast for about 40 minutes or so, until the flesh is soft. Heat the coconut oil in a large pot over medium heat and roast the onion for about 6-8 minutes until translucent. Add the garlic and ginger and roast for 1 minute longer while stirring. Peel the sweet potato and add along with the pumpkin flesh and spices to the pot. Pour in the broth and coconut milk. Bring to a boil, then reduce heat and simmer for about 5-10 minutes, to give the flavors time to meld. 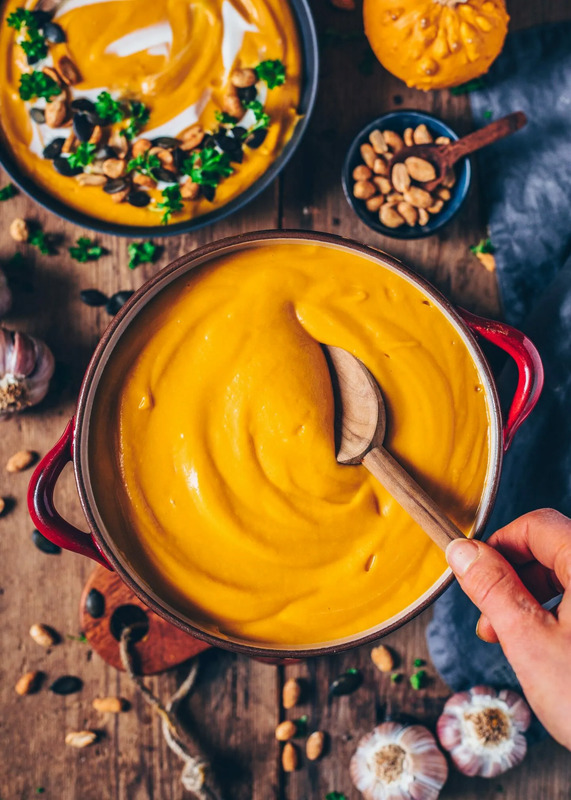 Remove the soup from heat and either blend this soup in the pot using an immersion blender, or transfer to a blender in batches and blend until smooth and creamy. Taste and adjust seasonings if necessary. Add more broth if you prefer a thinner consistency. Serve with some peanuts, pumpkin seeds, chopped parsley and a swirl of coconut cream as garnish, if you like. If using Hokkaido pumpkin (Red Kuri Squash), the skin softens during baking, so you don’t have to peel it. But if using another type of pumpkin or squash with a hard shell, make sure to peel the skin off after baking. Instead of roasting the pumpkin, you could also simply pan-fry pumpkin pieces along with the onions and then cook everything for about 15 minutes. The soup will last for up to one week in the refrigerator. You can also freeze this soup in an airtight container for even longer. So glad that you like this soup. Mine came out a bit lighter orange than yours but the taste is amazing! I didn’t have coriander so I added fresh parsley instead and I topped it with pumpkin seeds, roasted chickpeas and red pepper flakes for my lunches! Amazing! So glad that you liked this soup! Thank you! 🙂 Did you use roasted Pumpkin or cooked Pumpkin? The color also depends on which kind of Pumpkin you use and if you bake it in the oven or cook in water and so on.